The mass protests after the parliamentary elections have changed the political situation in Russia. But not enough to prevent Vladimir Putin from becoming president for the third time. “I was an election observer, but I was kicked out of the polling station for shooting violations on camera. I’m here because I felt like cattle. And I didn’t like it,” he explained. 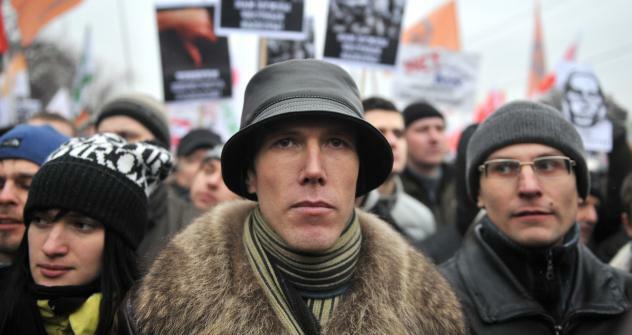 Ivan should be a typical representative of the protest movement. But Russian students are for the most part amorphous and apolitical. The driving force behind the protests has suddenly become the middle class. Gathering at the two December demonstrations were, according to various estimates, 50,000 to 100,000 representatives of the middle class. Surveys by sociologists (VTsIOM) at the second rally showed that there were few students, and that the backbone of the protestors were those over 20, with 37 percent over 45. Seventy-nine percent of them had a higher education. At one time, the authorities entered into a kind of agreement with the middle class not to interfere with politics. Sociologist and economist Alexander Auzan formulated it this way: “You give us loyalty; we’ll give you stability.” Boris Akunin, a writer and one of the leaders of the current protest, used even more scathing words: “Do what you want with us, just don’t take away the popcorn.” In any case, the middle class had indeed forgotten about politics, carried away by the establishment of a consumer society. However, at some point, the agreement was broken. “Until now, we wanted peace––after the revolution, wars, Stalinism, all that garbage. We wanted to work, settle down, buy an apartment. And thanks to this government, that’s what we got. But now people need something else,” said Fyodor Sheberstov, a 46-year-old recruiter who attended a protest for the first time in his life. Alexander Auzan says that one of the reasons for the protests is that the government can no longer guarantee stability. “The very foundation on which it has held power since 2004 has eroded. Hence the extremely pained reaction to the manipulation of the elections,” Auzan said. Supporters of the government claim that the potential of the protests is small and concentrated mainly online. Last fall, at the request of the magazine Ekspert, scientists from the Russian Academy of Sciences’ Institute of Control Sciences attempted to estimate the size of the politicized segment of the Russian Internet. They analyzed the entire array of entries in Russian on social networks for two weeks and recorded all entries with words from the political lexicon, such as “Putin,” “Medvedev,” “Navalny,” “United Russia,” and so on. The result showed that there are 60 million Internet users in Russia, but the creators of original “political” content number around 1,000 people, with approximately 30,000 commentors on this content. “The number of readers of this content is difficult to measure, and we also need to make allowances for the fact that the study was conducted before the elections and protests, but all the same, the audience, the strength for the protests, could not be more than a million people,” said Eksperteditor-in-chief and United Russia member Valery Fadeyev. On the other hand, even according to the official election figures, United Russia lost 15 percent of its support, or almost 10 million votes, compared with the 2007 parliamentary elections. The opposition says that this is the real potential of the protest. In fact, both of them are right. It simply comes down to different forms of protest. Compared with 2007, Russian society has truly become much more critical of the authorities. “People voted against United Russia because corruption has exceeded all conceivable limits. Our city is small, just 60,000 people, but everyone knows how much you need to pay in bribes to land a job in the prosecutor’s office, with the police, in court. Nothing is done without money. Just five years ago this wasn’t the case,” said a resident from Rostov Region. But there are two other essential points. First, the negativity has been directed mainly at local officials, not at Vladimir Putin. Secondly, provincial protesting is passive. In that same city in the Rostov Region, United Russia took about 60 percent of the vote, according to official figures. Everyone in the city knows that this isn’t accurate, but not a single person came out to protest. These factors essentially guarantee Putin’s election to a third term, but they also explain the authorities’ contradictory reactions to the mass protests. On one hand, the government has made concessions. It liberalized legislation for political parties; is considering a return to direct popular gubernatorial elections, which Putin abolished in 2004, and Vladislav Surkov, whose name is associated with the anti-democratic reforms of recent years, has left the presidential administration. But that is all that the protestors have been able to achieve. The central problem is that the protesters themselves still lack clearly defined leaders. The people who come to protest for the most part refuse to trust those who are considered the ideological opposition to Vladimir Putin’s regime––this applies to both the liberals, led by Boris Nemtsov and Garry Kasparov, and to various left and right wing radical groups. That’s why the protest movement is suddenly being led not by politicians, but by writers, journalists, musicians, and bloggers. They are the ones who’ve headed the League of Voters, a public organization that intends to monitor the fairness of the presidential elections. But the League of Voters is not going to become a political party. Former Finance Minister Alexei Kudrin and billionaire Mikhail Prokhorov are now trying to create political structures capable of winning the support of the protesting middle class. But this is hardly evidence of a split in the Russian power elite. Most likely, Kudrin and Prokhorov are starting their projects with the approval and supervision of Vladimir Putin, who both men consider a friend. In essence, the question is who will take control of the protest movement: the radically inclined bloggers like Alexey Navalny, or “insiders” like Kudrin and Prokhorov. Much will depend on how fair voters consider the March 4 presidential elections. Rigging will result in new protests. And conversely, relatively fair elections with minimum fraud will force Putin’s opponents to accept his victory, especially since the majority of the protestors oppose radical scenarios. Speaking at the rally on Sakharov Prospect, Alexei Navalny said: “I see here enough people to seize the Kremlin and the White House right now. But we are a peaceful force, we don’t do that. Yet…” In his revolutionary fervor, he obviously overestimated the revolutionary spirit of the masses. Middle class Russians want the authorities to hear them, but they are not ready to head to the barricades. This means that unless the government makes some strategic miscalculations, or the country experiences a severe economic crisis, the decisive battle between the current government and its opponents will just have to wait five years, when the next State Duma elections will be held. The opposition may well reach that point divided – since the current protests combine the right and left, nationalists and socialists. They are able to come together for one-time protests, but they are certainly far apart ideologically and will never work together to win an election. But if anyone manages to organize the middle class and put forward new leaders, they could pose a challenge to United Russia in future elections.